The trip to Ascension Bay for February 11-18, 2017 is full. Call me if you would like to be put on a wait list. 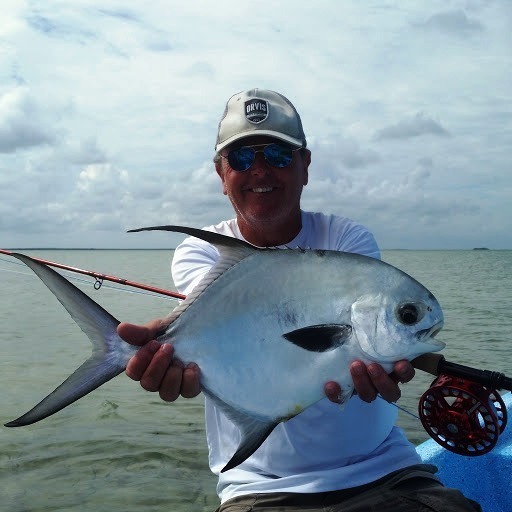 This will be a great way to catch a bunch of fish and escape the doldrums of winter in paradise. The weather is hot, and the fishing is hotter. 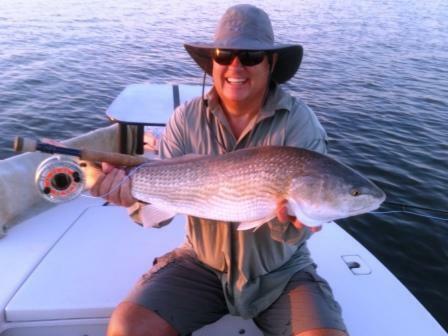 Late Spring and Summer have brought great red fishing to the Golden Isles. 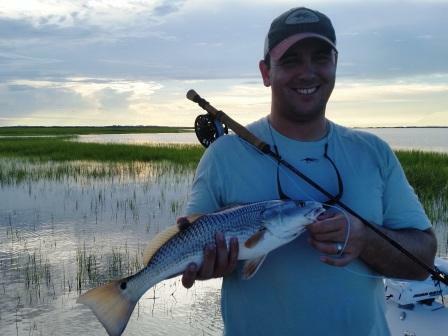 Red fish on the low tide have been great, particularly when the low tide is in the early morning. We will see reds pushing around in water inches deep chasing small shrimp. 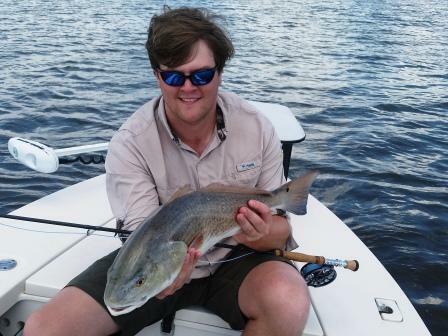 The red fish are tailing hard on the flood tides. We have seen over a dozen tails on some evenings. 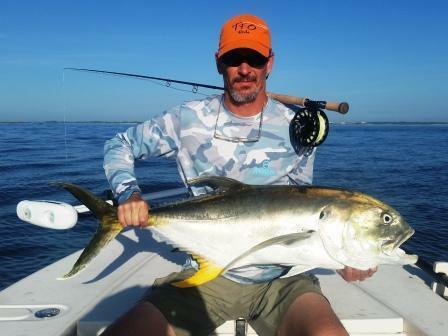 The big Jack Crevalle have returned to the sound. Hooking one of these is like hooking a Mac Truck. Tarpon are here, too. I don't target them often, but when you hook up, you are in for a treat. Trout fishing is good, and getting better. Not much more to say. I will let the photos do the talking. 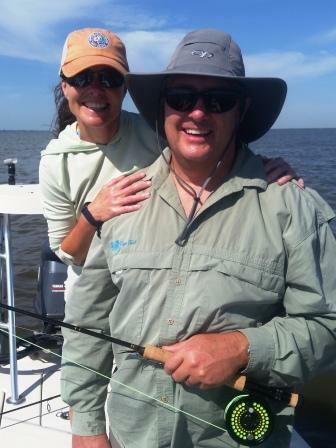 Give me a call if you are coming to the Golden Isles, and lets go "Hunting Fish in the Marshes of Glynn." I have never shared a photo of this fly before. 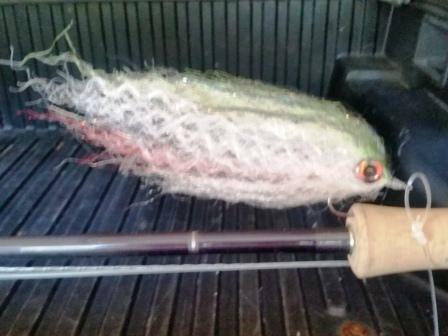 It is a Puglisi style baitfish pattern tied on a 3/0 Owner hook to imitate Menhadden or as they are called locally, Pogies. Our Pogies are large late in the summer. I developed this fly to imitate them. It is almost 6 inches long and is tied with Farrar's Flash blend. 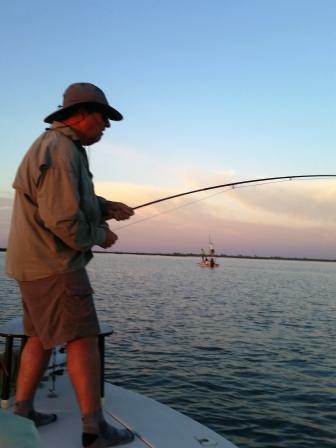 I start with a strand of red Puglisi color at the hook bend. Directly below the red, on the bottom of the hook shank, I start the belly area with white flash blend, I make several attachments of white on the bottom and top of the hook. When I am about 1/4" from the tie off point, I transition to chartreuse flash blend on the top of the hook, then transition to blue flash blend, all the while using white on the bottom of the hook. I tie off the fly and super glue eyes on either side of the fly, squeezing them together to give height to the fly. Make sure you do not glue the eyes below the hook shank. If you do, you will make the hook gap smaller, and you need all the hook gap you can get. Throw this fly on an intermediate tip fly line, which takes the fly just below the surface of the water, in front of a school of Jacks, strip fast, and hang on. You will have those fish fighting over it. Since it is all synthetic, it does not absorb water and throws easily. Enjoy the tie and enjoy the tug. 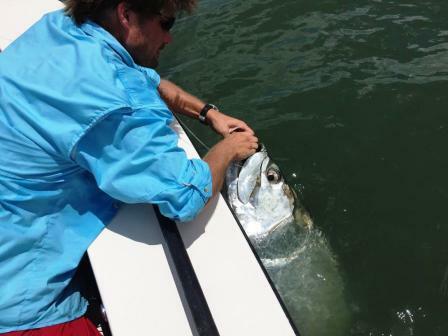 Summer brings the pelagic fish to the Golden Isles. Sharks, Tarpon, Jack Crevalle, and Triple tail are all here. We occasionally see a Triple Tail in the shallow water adjacent to the grass. Jacks are opportunistic targets. We look for them when they are here. Jacks are my favorite. If you find them, they are not particularly hard to catch and the fight can take anywhere from 30 minutes to over an hour. 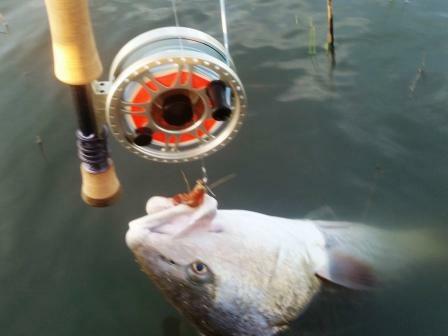 For most fly fishermen it will be the largest fish they have ever landed on a fly rod. Sharks and Tarpon are also available. If you hook one of these, just hang on. 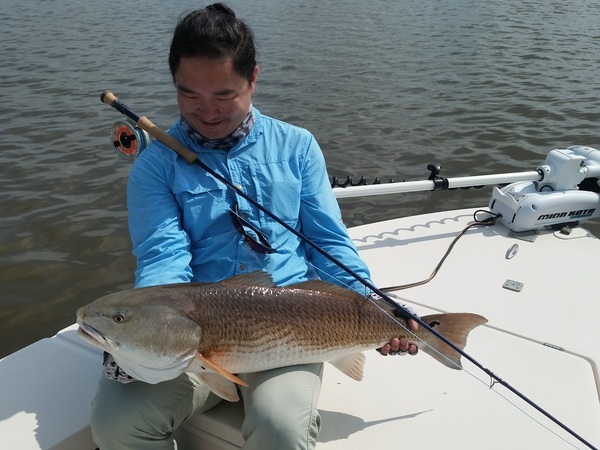 Red Fish tailing on the flood tides is the highlight of summer red fishing. This year the tides are highest on the New Moon. 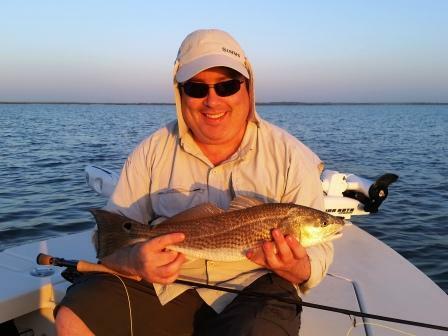 Red Fish pushing around on the low tide is best during the morning. This fishing will continue to get better and better as the shrimp get bigger and start moving out of the creeks. Trout fishing will also get better and better through December. Remember, the new minimum size limit is 14". There are lots of trout finning around our area.